This total comfort system is the highest efficiency equipment available. When weather on the coastline is extreme the compressor outside goes into high speed, the fan on the inside unit also goes into high speed. This complete combination maximizes cooling and de-humidification when needed. When demand is low this unit automatically goes into low speed outside and inside. When the unit is in low speed your efficiency increases and the amount of humidity removed greatly increases. The out of pocket expense is more but the advantages and annual savings far outweigh the cost. The condensing unit has an outdoor sensor so the thermostat displays outdoor temperature as well as indoor temperature. The system is completely automatic and controls exact temperature and humidity levels in the house. The two speed system pulls out 30 times the humidity as a standard system on a humid day. You don’t have to be an engineer to operate it, they are very user friendly. system pulls out 30 times the humidity as a standard system on a humid day. It sounds complicated but it’s not anyone can operate it. This system doesn’t remove humidity like the two-speed compressor but it is a big step up from the standard. The compressor speed never changes but the advantage is that elite fan motor on the inside does. So In the morning or evening when demand is not as great the fan goes into low speed, this feature lets the system remove an extreme amount of humidity. The truth is when your system is cycling on and off frequently such as in the morning or evening, the startup draws the most amount of energy, this is called short cycling. Short cycling with standard systems is very common. The variable speed blower will slow down the airflow and let the system run longer and end short cycling. This feature is completely automatic and with a THERMIDISTAT (thermostat with humidity control and outdoor temperature sensor) you can set your desired temperatures and humidity levels. This system removes 128 percent more humidity than with a standard system. It is an ideal feature for extreme coastline climates. (3) Standard system- is a single-speed compressor outside and single speed air handler inside. This system is probably going to perform similar to the one you currently have when it was new. Only today’s models are a lot more efficient. It is only temperature controlled, so when the temperature inside the house is warmer than your set temperature the unit will cut on until the house is satisfied. It blows ice cold air at the same flow on a 75 degree day as it would on a 95 degree day. Today in our humid, tropical Florida environment mold growth is a very common problem. Because of nice year long weather it is common to leave our doors and windows open letting in outside containments. Florida can be very damp and ideal for mold growth with water on both sides. Ultra violet light systems can give you freedom from air handler mold growth by exposing both the evaporator coil and circulating air stream to ultra violet radiation. These systems are affordable and don’t require much maintenance. When combined with a custom air cleaning system you can achieve much cleaner indoor air. Therefore, if air quality is a concern I would consider adding a U.V. 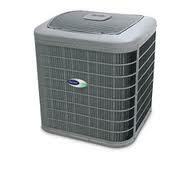 Light and air cleaner when purchasing a new central air conditioning system. 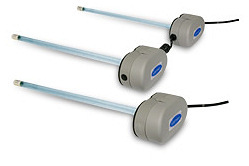 ultra violet light is the best around the clock defense against mold and germs. It mounts inside the air handler above the evaporator coil to control mold from growing on the coil. When an air handler is located in a garage or in an attic it is exposed to extreme conditions that are favorable to mold growth. The outside cabinet gets exposed to a lot of heat and humidity while the inside of the air handler is dark, cool and moist. This is the perfect breeding ground for mold spores to grow. The transformer is mounted on the outside of the cabinet, a hole is drilled through the air handler door and the bulb is inserted in the hole. The transformer wires into the air handler. When turned on it immediately take action and starts complete cleaning of air steam. It’s a breeze to install, usually done in 30 minutes or less. Another advantage of the U.V. Light is it kills germs and viruses when circulating air passes the bulb. The U.L. certified systems are designed for this application and are safe. The bulbs should be changed every year to remain effective. There is a light engineered on the transformer to let you know the bulb is still working. Homeowners don’t try to change the bulbs these should be done by a trained, dependable HVAC expert. These U.V. Systems are being used all over American cities in refrigeration, hospitals, daycares and offices. If your air handler or furnace is located inside the house, it is in a humidity controlled environment so mold is not as big a problem. If your air handler or furnace is in the garage this should be an American standard in any coastal environment. It can be an affordable retrofit later if it is not in your budget today. A mechanical or media air filter is usually a 4” air filter that is engineered under the air handler, furnace or in the return air plenum. It is a thick filter usually changed once a year. The problem with this type of filter is that after about 6 months it starts to fill up and makes it hard for air to pass through the filter. This causes static pressure in the system which reduces efficiency. If you use this type of filter it is to your advantage to take the filter out every four months and vacuum it out. This is the economy version of HVAC filters and it might be worth investing in something electronic, there are some affordable options such as the 1” (see below). This 10” filter is the elite version and wires into the air handler or furnace and creates an electro static field. When air passes through the filter it electronically charges the air flow and has the ability to remove particles as fine as .01 microns such as smoke or dust. 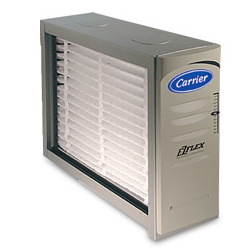 These filters offer complete control of air by removing even the finest of containments. They work much better than the above media filter and don’t slow the air flow. It usually has washable cells to cut down on replacement costs. This filter works similar to the electronic air cleaner above but is only 1” thick so it fits into air handlers with height problems such as in a closet or above a hot water heater. This filter also can be put into a filter back grill and it wires through the return to the air handler or furnace. This filter comes with three media pads that you change every four months. This is my favorite air cleaner because it doesn’t create much static pressure and the pads are cheap and easy to change. This filter works in almost any situation and is very reliable and effective. Check your ac filter every month during Florida’s extremely hot months. If the filter looks dirty after a month, change it. At a minimum, change the filter every 3 months (every one to two months in the summer can help). A dirty filter will slow down air flow and make the system work harder to keep you warm or cool — wasting energy. A clean filter will also prevent dust and dirt from building up in the system — leading to expensive maintenance and/or early system failure. A programmable thermostat is ideal for people who are away from home during set periods of time throughout the week. Through proper use of pre-programmed settings, a programmable thermostat can save you about $180 every year in energy costs. With the hot Florida summers this number could actually be higher. If you have an old dial style or slider thermostat it is probably time to change it. A thermostat is an instrument for maintaining the temperature of a system within a particular range by directly or indirectly controlling the flow of heat energy into or out of the system. All air conditioners have thermostats that can be manually operated or automatically preprogrammed to control the room temperature. There are many ways in which you can use an air conditioner thermostat effectively. One of the most successful yet economical ways to reduce your ac costs is to adjust the thermostat setting on the air conditioner. The savings are more noteworthy when you set your thermostat at 78 degrees Fahrenheit or higher. FP&L reported each degree you raise the thermostat settings, you reduce seasonal cooling costs by 7 percent to 10 percent. I had a customer in Titusville, Florida report savings of forty percent by adjusting the setting on his thermostat alone. In doing so, you can use ceiling fans in addition to the air conditioner and thus, save a lot of money. Another customer who lives here in central Florida stated he has a very predictable day meaning he leaves at the same time and returns at the same time Monday through Friday and he started using the custom programmable function on his thermostat and saved about a hundred dollars a month in the summer months. If you leave the system on a high/low setting during the day and set for ideal maximum comfort 30 minutes before you arrive home. This economy feature will save you a lot of energy and maximizes comfort. 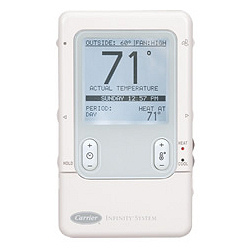 The best of the custom thermostats such as the Carrier Infinity Controller lets you accurately set indoor temperature and humidity levels in the house. The outside condenser has a temperature sensor that communicates with the thermostat so it tells you outdoor temperature as well. This complete comfort thermostat tells you when to change the filter, service reminders, static pressures on the duct system and the ac system is self diagnostic through codes read by the thermostat. All these features are only available on the American made Carrier Infinity model with the Infinity Controller. If you have a variable speed furnace or air handler then you should have a service expert install a THERMIDISTAT. This works similar to the Carrier Infinity Controller only you don’t have to have the Infinity two speed compressor. We custom mount an outdoor temperature sensor that reads through the thermostat wire and tells the thermostat when the indoor fan should be in low or high speeds. When it is not that hot outside the thermostat tells the fan to go into low speed and it gives the system more time to remove humidity. This thermostat also has a vacation mode so when you go out of town you hit this feature and it asks how many days, you punch it in and the air conditioner will only turn on when humidity levels are high it works similar to the classic de-humidistat. This economy feature saves a lot of money on power and is extremely accurate and easy to control. We offer both commecial and residential air conditioning in Central Florida in the following and surrounding areas.